Rev. Dr. Betsie H. Poinsett has experienced something no parent should have to – the death of her only child, her 21-year-old son, Bennett. Throughout his short life he seemed to walk to the beat of a different drummer. As Betsie would awaken in the middle of the night with feelings of helplessness, knowing that his behavior was spiraling out of control, the only thing she could do in those wee dark hours would be to go to her computer and start writing to relieve her fears. Thus, Mothers Who Cry in the Night, originated. 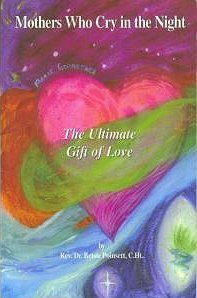 It takes the reader through those long lonely nights, giving them strategies to turn those out of control feelings around, and to learn how to rebuild themselves to understand that God and Love are the foundation that they can constantly return to when these dark nights of the soul envelope them. This story wasn’t over yet. I wondered how it would end. Bennett is dead on November 8, 1997 3:35 PM brain dead from yet another car crash. His truck had crashed into a tree in the early morning hours the night before, he was rushed to the hospital, hanging onto life until we could get there to say the final good-bye. I was in Gatlinburg in my motel room when Ed called me at 6 am. Bennett had been in an accident and it was very grave. Immediately when I hung up the phone, my guides gave me a message that he was with the angels, but that he would wait until I got there to say good bye. I was shown a vision of all of his ancestors standing around his lifeless body as they waited for him on the other side. After what seemed like the longest drive of my life, we finally arrived at the hospital at 2:00 PM. I immediately put my amethyst crystal on him and sent the healing energy from my hands into his body, just like I had done in his first DUI accident. But this time I kept telling him that he had our permission to go to the light. “It is your choice,” I said. I only wanted him back if he could be transformed; because the pain of watching him in these last few weeks was so agonizing I knew I couldn’t take it much longer. And now the finale. Ed and I were around him and sending our love. I touched his face to stroke his cheek and, just as in life, he shook me off. Ed rubbed his feet and he clearly moved his legs as if to say, “Stop it; leave me alone” - just as he had always done to us in the past. And then he died. We joined hands and Ed recited the 23 Psalm. Bennett’s wishes were that we donate his organs and so we did. When that happens they keep everything going with machines until the organs can be taken so it looks like they are still alive. My mind kept asking: “Is he really dead? How do you know? What have I done? Could he have revived? I believe in miracles, would this be one?" I insisted on waiting for the neurosurgeon. He was in surgery and I had to wait over an hour. But I had to know. I had to be shown that he was dead. He tested and showed me. They took him off the respirator and after 4 minutes it was still a flat line – no brain waves, either. I knew I had to see that proof to really know. If I hadn’t seen that for myself I would have always wondered. I didn’t want to wake up in the middle of the night for the rest of my life wondering if I had done the right thing. The ICU staff said they had never seen a family act like we did. They were really inspired by our attitude and our faith, especially because we gave him permission to die to go on, to be free. When I told one nurse that he was exactly where he wanted to be, she said she got chills. Yes, confirmation that it was true. We finally left the hospital at about 7:30 PM and started the long drive home. My dear friend Kitty said his energy form came to her at about 8:00 PM, the lights started flickering, the phone started ringing and yet no one was there when they picked it up. She suddenly realized that Bennett’s spirit was there, scared and confused. She calmed him down and helped him understand that he was on the other side and it was OK. He had created this and now he was experiencing what it was like to be on the other side. She told him he had a choice to go back into his body if he wanted to. I pictured him saying, “I don’t know where my body is, but I’ll be damned if I’ll go back! I worked too hard to get over here." She encouraged him to find Tom who was flying home from Japan. Bennett told Kitty, “Oh yes, I have already visited him!” And at exactly 3:30 Tom said he felt someone’s spirit come to him while he was on the plane! I found out that his organs were taken at 11 am the next day, which helped me realize that he had had plenty of time to go back into his body if he wanted. Almost 15 hours. It wasn’t like they had taken his organs in 20 minutes. It comforted me to know that he had that time and had made the decision to be free. He was clearly visiting many people. He was so happy to be free, soaring and at peace at last. My friend Pam felt him earlier that day, just after Ed had called me in the morning. She was taking a shower and looked out the window and saw a cloud – the only one in the sky! She felt it was Bennett’s soul and after that her doorbell rang and no one was there. We knew it had been Bennett. As I’d always loved watching the mist form above the lake outside our house, it was not odd to find me doing so in the early morning hours following his death. Standing by the window overlooking the lake, I was remembering how he had managed to walk defiantly away from eight similar accidents without a scratch on him---but not, I thought to myself, was he able to this time. By now I understood Bennett had been one of those children beginning to be known as “Indigo.” He hadn’t felt anyone really liked or understood him, had stretched every boundary, had indeed been a proverbial “wild child.” I had also come to the understanding that throughout Bennett’s 21 years of tumultuous life experiences, all of my spiritual beliefs had been challenged and re-evaluated. It had been at times “pure hell,” but rather than having “gone off the deep end,” as I had often thought I might, in the end I had actually grown tremendously in spirit and in fact had been quite transformed. It had been a long and sleepless night and I now sat comfortless in our living room watching the mist begin to rise above the lake. As it took shape, a soft, quiet voice within began imploring me, “Get up!” it urged. “Really, look at that mist.” I stood up and went to the window to get a better view, and immediately realized it truly was like no other I had ever seen. Rather, it was like looking at one of those Magic Eye pictures. Inside the mist shapes began to form. I saw that they were angels who rose up and moved forward. Then came the spirits of all the children Bennett had known---all who had died before he had---moving elegantly in a free form slow dance. (Bennett had lost over 25 friends to death between 1991-1997, all from accidents, drug overdose or suicide) One by one they rose above the mist, with arms graciously moving in the air. They seemed to luxuriate in their freedom. Suddenly, soaring off above them, I recognized Bennett! He held the form of a dragonfly--- his chest arched out, his head reared proudly back, as he led the way for the others. Again I heard a voice from within, this time his. “Look, Mom, I’m Free!” he proclaimed with utter abandonment. And indeed he was. I stared wide-eyed, then blinked several times and stared again, completely mesmerized by the amazing scene unfolding before my eyes. The angels continued their upward spiral---higher and higher as more and more spirits collected themselves underneath until they billowed out across and above the water. One after another, each paraded in front of me as I watched from the window. Besides the angels, Bennett, and the spirits of his deceased friends, there also rose and came buffalo, men on horseback and Native American Indians. Their magnificent procession lasted for over 30 minutes. Several times during the process, I turned away and closed my eyes, then turned back quickly, just to see if the images would still be there. And each time, they were. I was not hallucinating. It was happening just as I saw it. The realities of life here on Earth and the after-life Bennett was entering were converging right in front of my very eyes. Suddenly I thought about the Native American Vision Quest Bennett had made in 1996, during which time he had taken three days to find what was called his “animal totem.” It had been a dragonfly and had forever remained his “trademark,” to some, even his nickname. I remembered the magnificent blue dragonfly he had tattooed on his chest—the same chest I had just seen proudly beckoning the others to follow him across the sky! Totally aware of the supernatural spiritual implications my son was now revealing to me, as I also remembered how, my own dragonfly research had taught me that a “dragonfly” is often called upon to guide one’s spirit through “mists of illusion into the path of transformation.” Here now before me were both the mist and the transformation! Together we stood watching, unable to speak, until slowly each manifestation faded away. It was then that I understood the most amazing thing: this whole spectacular event had been Bennett’s most extraordinary gift to us.